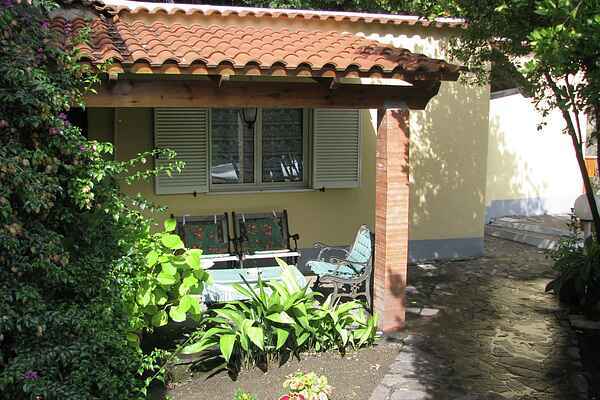 Holiday home on the lovely Isle of Ischia there is a pair of mini-apartments close to the centre centre and typical square of the village of Piedimonte, a district of the town of Barano Ischia. The mini-apartments are surrounded by green hills and covered with vineyards. The decor of the holiday home is bright and attractive. The islands clean air and peace and quiet guarantee a relaxing, healthy holiday. The holiday home is about 15 minutes from the harbour of Ischia; the enticing beach at Maronti is just 3 km away. This beach is amost 2 km long and is well known for its thermal springs. The island is also a good base for visits to Sorrento, the Amalfi coast and Capri. The house is suitable for 2 adults and 2 children. The homeowner can provide information about the ferries from Naples to Ischia.